Figure 1. Eucrytidium punctatum (Ehrenberg) group. Figure 2. Eucrytidium punctatum (Ehrenberg) group. Figure 3. Eucrytidium cienkowskii Haeckel group. Figure 4. Eucrytidium cienkowskii Haeckel group. Figure 5. Eucyrtidium cienkowskii Haeckel group. Figure 6. Lophocyrtis regipileus Chen. Figure 7. Lophocyrtis regipileus (?) Chen. Figure 8. Lophocyrtis regipileus (?) Chen. Figure 9. Lophocyrtis golli Chen. Figure 10. Lophocyrtis golli Chen. Figures 11, 12. 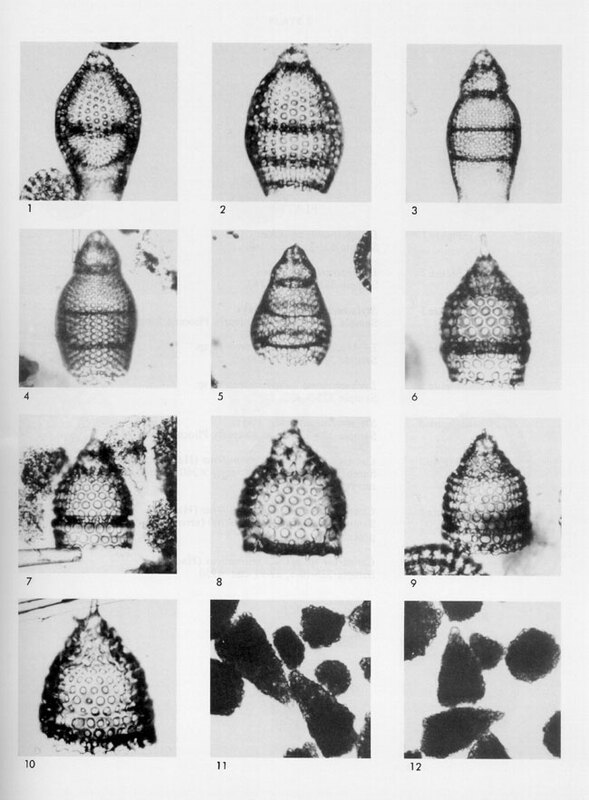 Recrystallized Cretaceous radiolarians. Sample 323-18-3, 143-145 cm; x150.